William Kensey was summoned for jury duty. Like most jurors he was more than a bit reluctant especially when he discovered the purpose of the trial. Kensey and his fellow jurors were asked to rule whether God exists. Perhaps middle aged, Kensey was asked to serve on the jury because he had recently lost his dad in a traffic accident. Perhaps he was asked to serve because he questioned his faith after the funeral. Perhaps this was his wake up call. Several things jumped out at me in this trial. One was the diversity of the jury. They were from different cultures with different beliefs. The one thing they had in common was they had read very little if any of the many books written about God. The jury was forced to listen to many witnesses; a great many topics were discussed including: science, medicine and evolution. The court was more interested in proving God does not exist than that he does. Many of the arguments presented were questions most of us ask at sometime in our life. "If God knows everything including what we are going to do before we do it then do humans actually have freewill?" "If God is so loving, why do people suffer?" John Betcher offers readers a book that will make them think. He has presented both sides of the issue and allows readers to determine where they stand. This book is difficult for me to review, because I do not want to give away too much. Even in giving my opinion I am in danger of sharing too much. Betcher pointed out the five obstacles that prevent man from believing in God: anger, fear, ego, idolatry, and comfort. 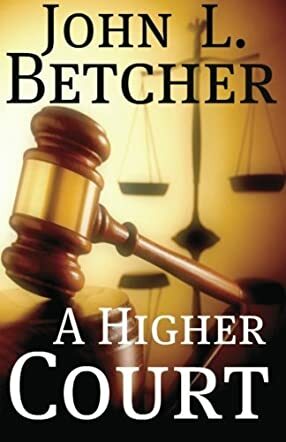 A Higher Court is a gripping novel that will leave the reader pondering the depth of their beliefs. I became William Kensey as he sat in the courtroom listening to both sides of the argument. Who was really on trial, God or the individuals? Is my faith strong enough to face scrutiny? Will I accept the mission? Betcher is a brilliant writer, he entertains as he teaches. The ending really surprised me. I wonder if Betcher was given a mission--of course he was, I believe we each have a mission and perhaps his mission was to write this book. The plot of A Higher Court is amazing, and it obviously took a great deal of research. I will be watching for more books by this author and highly recommend this book for Christians and non Christians alike.